A lot of stuff to get to today. 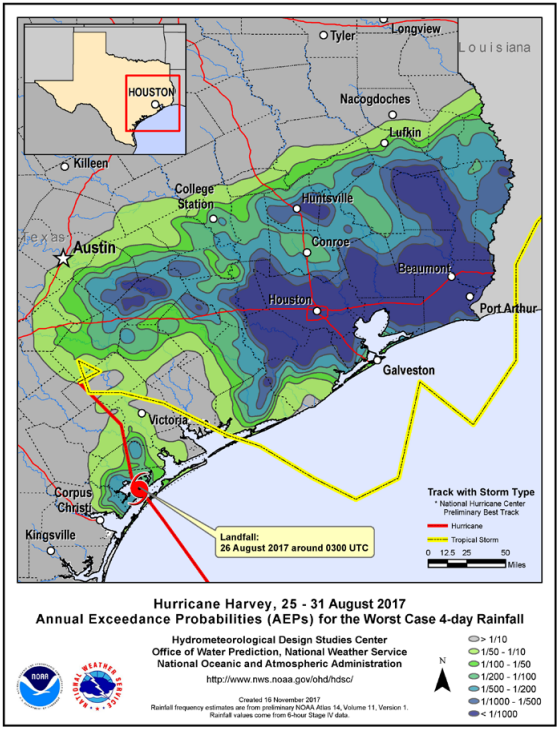 We’ll go through the forecast first, and then jump into the National Hurricane Center’s final report on Hurricane Harvey, released yesterday. We’re thinking today will be a rather uneventful weather day. We should see a good deal of cloud cover around, with limited (if any) sunshine. Temperatures are starting the day much warmer (around 50° in most spots, roughly 15° milder than yesterday at this time), and they’ll likely finish warmer than yesterday too. We should manage about mid-60s this afternoon. In terms of rain, the bulk of today should be dry, but there could be some sprinkles or showers. Things do change tonight as onshore flow continues, driving in ample moisture. A weak disturbance passes offshore, and this combination will lead to increasing rain chances as the night goes on. The best chance for the most shower activity will be south and east of US-59. The general rule of thumb will be that the closer to the coast you get, the better rain chances will be. Saturday will see shower chances continue in the region, but I think they’ll be highest both in the early morning and later afternoon. And once again, they’ll be highest south and east of Houston. Still, have an umbrella handy Saturday. It will be warm again, with highs near 70 degrees. Generally, we’re only expecting about a half inch or less in and around Houston. 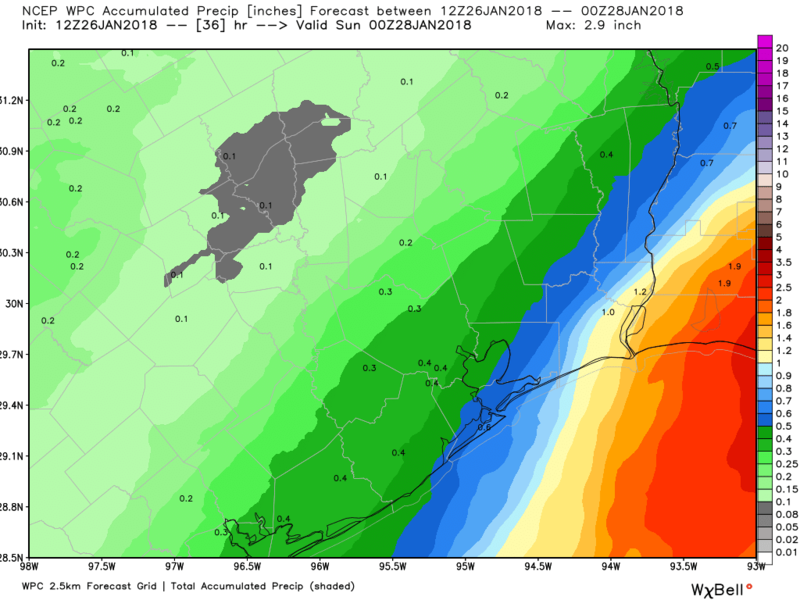 Some coastal locations could see upwards of three-quarters of an inch or so of rain. Higher amounts will be possible as you move toward Beaumont-Port Arthur and Lake Charles. Also, watch for some patchy dense fog along the coast (or even in some inland spots) later today through Saturday night. A cold front will pass through the area Saturday night without much punch. You’ll notice it more Sunday with lowering humidity and gradually decreasing clouds. Expect temperatures to top off near 65° or so on Sunday. Sunday night will be chilly, with lows back into the 40s in the area. Monday and Tuesday continue to look splendid, with highs in the low-60s and lows in the 40s. We’ll see a warm up with increasing clouds and minor rain chances after Wednesday. The highest storm total rainfall that can be confirmed is 60.58″, which occurred near Nederland, TX in the Beaumont-Port Arthur area. A 60.54″ report was confirmed in Groves, TX near Port Arthur as well. Both of these totals, along with five others (most in the Friendswood area), establish a new United States record for rainfall associated with a tropical cyclone, breaking the 1950 total of 52″ in Hawaii from Hurricane Hiki. The previous Lower 48 record was 48″ from Tropical Storm Amelia in Medina, TX back in 1978. Harvey broke that record in at least 18 locations. Radar estimates of 65-70″ were noted, but cannot be confirmed. The spatial extent of the heaviest rains from Harvey was “overwhelming” and likely has never been matched in American history. Harvey was the second costliest tropical cyclone in US history behind only Hurricane Katrina. At least 68 deaths from Harvey in Texas (about half of which occurred in Harris County) were the most from a Texas tropical cyclone since 1919. However, zero deaths are attributable to storm surge, which is amazing for a storm of this magnitude. Highest observed wind gust was 126 kt (145 mph) near Rockport. 57 confirmed tornadoes in the Southern US from Harvey. Over 300,000 structures were flooded, along with over 500,000 vehicles. 30,000 water rescues were conducted and 40,000 people evacuated from flooding. The map above shows the exceedance probabilities from Harvey’s footprint. The dark blue indicates it was at least a 1,000 year flood event, or a flood event that has no greater than a 0.1% chance of occurring in a given year, assuming a stationary climate and accurate estimates. The map speaks for itself. Harvey was unprecedented. Obviously, this storm won’t be forgotten anytime soon in this part of the world. Reading this report still gives this meteorologist chills. I’m starting to hear from a few of the outdoor sites i visit that we could be in for another super-duper blast of arctic air towards the end of the first week of February. I’d appreciate your thoughts on this. Thank you in advance. Hi John. It’s entirely possible it happens. The setup is absolutely developing in about 7-10 days. But whether it can deliver all the way to the Gulf Coast is a question I’m not confident in answering yet. I’d say odds of another potent (for Texas) cold period in early to mid-February is greater than 50%, but that’s about all you’ll get me to say right now. It’s very much a “wait and see” situation, but the rumblings you’re hearing are rooted in reality. I don’t know that I shall ever read something about Harvey where I don’t learn something new, which is something for a storm I have followed so closely from wave through final dissipation and beyond. I have actually re-read many of HGX’s products for Harvey many times since. I would love to see an NWSChat archive from those days. I assume that there will be, but I have been unable to locate anything. Have you heard if there will be an NWS Service Assessment? It certainly meets all four criteria they lay out. Of course, they will almost certainly release assessments for Irma and Maria, so I can see how they might take a long time to put together. I suppose it is possible they could do all three, though I think that might be a bit much. Eyeballing it, Harvey alone impacted no fewer than a dozen WFO CWAs, and quite possibly 20 or more. Texas alone is probably no fewer than 6. There is an ongoing NWS Service Assessment of Harvey. I contacted the team lead and the goal is to have the report done early this Spring. I thought Alvin got 72″ of rain from a TS in the late 70s. At least that’s what I recall Nolan Ryan stating in his autobiography. And Nolan would never lie. Just saw some Harvey pictures from our Port Neches plant this week. The storm track moving to the west before second landfall really did them in. People still aren’t back in their first floor offices yet. There was 5′ of water in them. The Alvin record was 42″ of rain in a 24 hr period due to TS Claudette. I don’t know if Harvey will beat that since it was a longer period of rainfall, but it’s entirely possible. Alvin received ~43″ of rain in 24 hours from Tropical Storm Claudette in 1979, still the US record for a single day. There’s still a lot of businesses that received backwater flooding from Barker reservoir that are gutted. I assume it is still the same elsewhere, as well. Yeah, as others have noted, Alvin was ~42″ in 24 hours from Claudette. That beats Harvey for 24 hours, but it was also extremely localized. Harvey demolishes any previous storm in terms of size, duration, and scope of rainfall. Alvin holds the record for 24-hour rainfall at 42″, July 25, 1979, courtesy of Tropical Storm Claudette. The rainfall records set by Harvey were for total rainfall in the U.S. from a tropical cyclone. As amazing as the rainfall rates at times were from Harvey (the NHC report referred to by Matt mentions rainfall rates up to 6.8″ per hour! ), the rainfall amounts observed were spread out over 5 days. I’m curious if anyone on has done a report about debris and in general junk that may have collected in the drains, gutters, gully’s , creeks, bayous, ect… and how that might cause problems for this coming spring. Buffalo Bayou above Barker Reservoir at least to 99 is still outside of the main channel. I can only assume it is due to debris, particularly downstream, and possibly channel modification from the recent floods. The Willowfork Drainage District and Fort Bend County are both doing some dredging of the bayou and a major flood control channel. That may be starting to have an impact on the water level. I did notice that the Tax Day Flood seemed to have resulted in some modification to the channel. I can only assume Harvey did even more. We already know that the three or so major floods on the Brazos in the last couple of years modified the channel at the 99 bridge. I’d planned an outdoor party at 2:00 on Saturday in central Houston. Looking at the NWS hourly forecast, they show rain chances going to 60% starting at noon and staying there until five. Can you give me any cause for optimism or should I put an indoor contingency plan into play? The more I look at the forecast, the more I think off and on showers tomorrow. Nothing serious, but if I were holding an afternoon party, I’d have a contingency plan just in case. Thanks again, Matt. This site is just so practical! 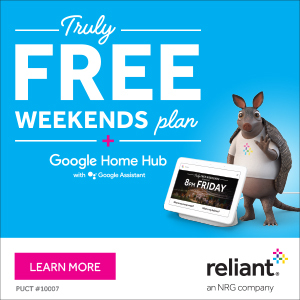 Truly an amenity of living in the Houston metro. How many lives were lost in Hurricane Harvey? The only thing I find unbelievable in all that is that only 40k people were evacuated. Seems to me like that is way low. I thought the same thing. But the article states 40k were evacuated TO SHELTERS. It then mentions that in Fort Bend Co alone, 200k were evacuated. I didn’t see an estimate of those evacuated for the entire affected area, although I think that would be interesting as well. Is there a map that shows where the radar indicated totals approaching 70” were located? It should be in the report linked to in the post. Toward the end of it. It’s a 76 page PDF, but about 50 pages are tables & pictures. Hi Matt! This unprecedented roaring of rains would give ANYone with brains “the chills”. I was so impressed to see you have the gumption to SAY THIS! There really is a reason for the growing differences in what we see going on earthwide, weather-and-other-ways. The Bible tells us about these dramatic changes all bubbling up at the same time the closer we get to the end of this old system of things, Matt. Jesus told the people about these over and over! These are truly a sign of the times in which we are living. 2Timothy3:1-5 explains it so succinctly. I am a student working on a story about Hurricane Harvey. I would be really interested in your perspective. I am especially interested in the different ways people predict storms and what prevents creating better protection against storms for Houston. Please let me know if you’re available for an interview. Thanks Noelle. I’ve passed this along to Matt.